Jacob Dexheimer was born on 21 August 1817 in Biebelnheim, Rheinhessen. The 24 August 1817 baptism of Jacob Dexheimer was recorded in the Reformed churchbooks of Biebelnheim, Rheinhessen. Sponsors were Jacob Wolf and Magdalena, local citizen. He married Catharina Hock on 2 October 1843 in Philadelphia, Pennsylvania, at St. Michael's and Zion Lutheran Church. Jacob Dexheimer appeared in the 1844 Philadelphia, Pennsylvania, City Directory at Charles below Buttonwood listed as a tailor.. He filed a declaration of intent to become a US citizen on 26 July 1844 at Court of General Quarter Sessions, Philadelphia, Pennsylvania. Jacob Dexheimer appeared in the 1845 Philadelphia, Pennsylvania, City Directory at Charles below Buttonwood listed without an occupation..
Jacob Dexheimer appeared in the 1846 Philadelphia, Pennsylvania, City Directory at Charles below Buttonwood listed as a tailor..
Jacob Dexheimer appeared in the 1847 Philadelphia, Pennsylvania, City Directory at Charles below Buttonwood listed as a tailor.. He was naturalized on 7 October 1847 at Philadelphia, Pennsylvania. Witnessed by Christian Hahn. Jacob Dexheimer appeared in the 1848 Philadelphia, Pennsylvania, City Directory at Charlees below Buttonwood listed as a tailor..
Jacob Dexheimer appeared in the 1849 Philadelphia, Pennsylvania, City Directory at Charles below Buttonwood listed as a tailor..
Jacob Dexheimer appeared in the 1850 Philadelphia, Pennsylvania, City Directory at Charles below Buttonwood listed as a tailor.. He was a tailor, according to the 1850 census. Jacob Dexheimer appeared in the 1851 Philadelphia, Pennsylvania, City Directory at Charles below Buttonwood listed as a tailor..
Jacob Dexheimer and Daniel Kornbau appeared in the 1852 Philadelphia, Pennsylvania, City Directory listed as Dexheimer & Kornbau, tailors, at 4 Vine above Franklin..
Jacob Dexheimer appeared in the 1853 Philadelphia, Pennsylvania, City Directory at Charles above Noble listed as a tailor, with a separate listing as Dexheimer & Kornbau, tailors, 4 Vine above Franklin..
Jacob Dexheimer appeared in the 1854 Philadelphia, Pennsylvania, City Directory at Charles above Noble listed as a tailor, with a separate listing as Dexheimer & Kornbau, tailors, 4 Vine above Franklin..
Jacob Dexheimer appeared in the 1855 Philadelphia, Pennsylvania, City Directory at Charles above Noble listed as a tailor at Vine above Franklin, with a separate listing as Dexheimer & Kornbau, tailors, at 4 Vine above Franklin..
Jacob Dexheimer appeared in the 1856 Philadelphia, Pennsylvania, City Directory at Charles above Noble listed as a tailor at Vine above Franklin, with a separate listing for Dexheimer & Kornbau, tailors, at 4 Vine above Franklin, and also listed under "Tailors and Drapers" as Dexheimer & Thornbau, Nine below 8th [sic]..
Jacob Dexheimer appeared in the 1857 Philadelphia, Pennsylvania, City Directory at 37 Garden listed as a tailor at Vine above Franklin, and also under "Tailors and Drapers" as Dexheimer & Thornbau at Vine below 8th..
Jacob Dexheimer appeared in the 1859 Philadelphia, Pennsylvania, City Directory at 1320 North 10th listed as a tailor at 714 Vine, and also under the heading "Tailors and Drapers" as Dexheimer & Khornbau at 714 Vine..
Jacob Dexheimer appeared in the 1860 Philadelphia, Pennsylvania, City Directory at 446 North 9th Street listed as a tailor at 714 Vine, with a separate listing for Jacob Dexheimer & Daniel Kornbau, tailors, at 714 & 716 Vine..
Jacob Dexheimer and Catharina Hock appeared in the US federal census of 1 June 1860 in Philadelphia, Pennsylvania. Other members of the household included Charles Herman Dexheimer and Edward Dexheimer. Jacob Dexheimer appeared in the 1861 Philadelphia, Pennsylvania, City Directory at 446 North 9th listed as a tailor at 714 Vine, and separately as Jacob Dexheimer & Daniel Kornbau, tailors, at 714 Vine..
Jacob Dexheimer appeared in the 1862 Philadelphia, Pennsylvania, City Directory at 1302 Lawrence listed as a tailor at 446 North 9th, and also as "John" Dexhiemer, tailor, at 714 Vine. There is no mention of Daniel Kornbau in this directory..
Jacob Dexheimer appeared in the 1863 Philadelphia, Pennsylvania, City Directory at 1216 Melon listed as a tailor at 714 Vine, and separately as Jacob Dexheimer & Daniel Kornbau, tailors, at 714 Vine..
Jacob Dexheimer appeared in the 1864 Philadelphia, Pennsylvania, City Directory at 1216 Melon listed as a tailor at 714 Vine, with a separate listing for Jacob Dexheimer and Daniel Kornbaugh, tailors, at 714 Vine..
Jacob Dexheimer appeared in the 1865 Philadelphia, Pennsylvania, City Directory at 1220 Marshall listed as a tailor at 714 Vine. Daniel Kornbau is listed elsewhere in the directory as a tailor at the same address, but they do not appear to have a joint listing in this directory..
Jacob Dexheimer appeared in the 1866 Philadelphia, Pennsylvania, City Directory at 1220 Marshall listed as a tailor at 714 Vine, and separately as Jacob Dexheimer & Daniel Kornbau, tailors, at 714 Vine..
Jacob Dexheimer appeared in the 1867 Philadelphia, Pennsylvania, City Directory at 1220 Marshall listed as a tailor at 714 Vine, and separately under "Tailors" at the same address..
Jacob Dexheimer appeared in the 1868 Philadelphia, Pennsylvania, City Directory at 1220 Marshall listed as a tailor at 714 Vine, and also under "Tailors" at the same address..
Jacob Dexheimer appeared in the 1869 Philadelphia, Pennsylvania, City Directory at 1220 Marshall listed as a tailor at Vine near North 8th..
Jacob Dexheimer appeared in the 1870 Philadelphia, Pennsylvania, City Directory at 1220 Marshall listed as a tailor at 714 Vine..
Jacob Dexheimer and Catharina Hock, appeared in the US federal census of 1 June 1870 in Philadelphia, Pennsylvania. Other members of the household included Charles Herman Dexheimer and Edward Dexheimer. He was a tailor, according to the 1870 census. Jacob Dexheimer appeared in the 1871 Philadelphia, Pennsylvania, City Directory at 1220 Marshall listed as a tailor at 714 Vine..
Jacob Dexheimer appeared in the 1872 Philadelphia, Pennsylvania, City Directory at 1220 Marshall listed as a tailor at 714 Vine..
Jacob Dexheimer appeared in the 1873 Philadelphia, Pennsylvania, City Directory at 1220 Marshall listed as a tailor at 804 Vine.. The following appeared on 21 July 1873 in the North American and United States Gazette: The store and dwelling of Jacob Dexheimer, No. 804 Vine street, a new building, showed such signs of weakness Saturday, on the front, that the goods were removed to the rear portion of the premises, and ropes were put up in front by the police, under the direction of Captain Thompson, to prevent accidents to passers by. The weakness is supposed to have been daused by digging under the foundation for a drainpipe. Yesterday a portion of the front fell down, but no one was injured. Jacob Dexheimer appeared in the 1874 Philadelphia, Pennsylvania, City Directory at 1220 Marshall listed as a tailor at 804 Vine..
Jacob Dexheimer appeared in the 1875 Philadelphia, Pennsylvania, City Directory at 117 North 9th Street and also listed separately as J. Dexheimer & Sons (Jacob, Herman & Edward), tailors, 117 North 9th..
Jacob Dexheimer appeared in the 1876 Philadelphia, Pennsylvania, City Directory at 1220 Marshall with a separate listing as Dexheimer & Son (Jacob & Herman C.), tailors, 117 North 9th..
Jacob Dexheimer appeared in the 1877 Philadelphia, Pennsylvania, City Directory at 1220 Marshall with a separate listing as J. Dexheimer & Son (Jacob & Herman C.), tailors, 117 North 9th..
Jacob Dexheimer became a widower at the 14 May 1877 death of his wife Catharina Hock. Jacob Dexheimer appeared in the 1878 Philadelphia, Pennsylvania, City Directory at 808 Poplar listed as a tailor at 117 North 9th, the same location as his son Herman.. He married Catherine Brester, daughter of John Brester and Hannah Mylie, between 1877 and 1880. Jacob Dexheimer appeared in the 1879 Philadelphia, New York, City Directory at 1005 Girard Avenue listed as Daniel Kornbau & Son (Daniel & Rudolph J. 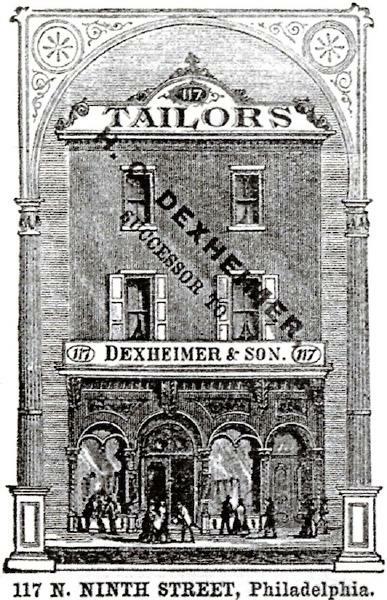 ), tailors..
Jacob Dexheimer appeared in the 1879 Philadelphia, Pennsylvania, City Directory at 808 Poplar listed as a tailor, at the same address as his son Edward..
Jacob Dexheimer appeared in the 1880 Philadelphia, Pennsylvania, City Directory at 806 Poplar listed as a tailor.. He was a merchant tailor, according to the 1880 census. Jacob Dexheimer appeared in the 1881 Philadelphia, Pennsylvania, City Directory at 806 Poplar listed as a tailor..
Jacob Dexheimer appeared in the 1882 Philadelphia, Pennsylvania, City Directory at 806 Poplar listed as a tailor..
Jacob Dexheimer appeared in the 1883 Philadelphia, Pennsylvania, City Directory at 806 Poplar listed as a tailor..
Jacob Dexheimer appeared in the 1884 Philadelphia, Pennsylvania, City Directory at 806 Poplar listed as a tailor..
Jacob Dexheimer appeared in the 1885 Philadelphia, Pennsylvania, City Directory at 803 Poplar Street listed as a tailor.. The following appeared on 24 April 1885 in The Philadelphia Inquirer: A gold watch, valued at ninety dollars, was stolen yesterday morning from the tailor store of Jacob Dexheimer, No. 803 Poplar street, by one of two colored men who entered the store and engaged him in conversation. Jacob Dexheimer appeared in the 1886 Philadelphia, Pennsylvania, City Directory at 803 Poplar listed as a tailor..
Jacob Dexheimer appeared in the 1887 Philadelphia, Pennsylvania, City Directory at 856 Randolph with no occupation specified..
Jacob Dexheimer appeared in the 1888 Philadelphia, Pennsylvania, City Directory at 856 Randolph listed as a tailor..
At the time of his death Jacob Dexheimer was living in Philadelphia, Pennsylvania, at 856 Randolph Street. He was interred at Mt. Vernon Cemetery, Philadelphia, Pennsylvania. Jacob Dexheimer died on 22 January 1888 at age 70 in Philadelphia, Pennsylvania. Catherine Brester became a widow at his death. The following appeared on 25 January 1888 in The Philadelphia Inquirer: [Died] On January 22d, Jacob Dexhimer, aged 70 years. The relatives and friends of the family are respectfully invited to attend the funeral, this day, at 1 o'clock, from his late residence, No. 856 Randolph street. To proceed to Mount Vernon Cemetery. No probate records have been found.